Mount Glory - is the southern-most peak in the Teton Range, and rises just north of Teton Pass. Without a doubt, it is the toughest one mile I've ever hiked. It's only one mile to the summit, but it's also a whopping 1655 feet of climbing (and suffering) to reach the top. Fortunately you'll be well rewarded with stunning panoramic views at the summit. Coal Creek Meadows - out of the three trails we hiked near Teton Pass this was by far my favorite. The upper portions of Coal Creek Meadows are very beautiful. Moreover, we continued on for another half-mile beyond the typical stopping point, and made the short climb up to Coal-Mesquite Divide where we enjoyed outstanding views of the southern Teton Range, as well as Grand Teton itself in the far-off distance. Black Canyon Overlook - this hike also begins from the top of Teton Pass, but travels south from the highway. This trail offers a plethora of wildflowers, as well as great views of Jackson Hole, Black Canyon and the Snake River Range. All three hikes offer a degree of solitude when the summer crowds invade all of the popular trails in Grand Teton National Park. 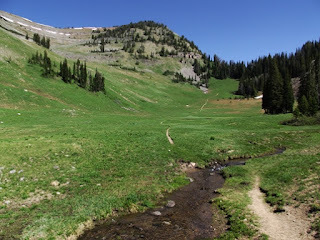 As mentioned above, we also had a chance to do a little hiking in the Bighorn Mountains. We were able to add four hikes from this region, including Sherd Lake, Rainy Lake, Otter Lake and the Cloud Peak Wilderness Overlook. All four destinations pass through the Cloud Peak Wilderness in the Bighorn National Forest. 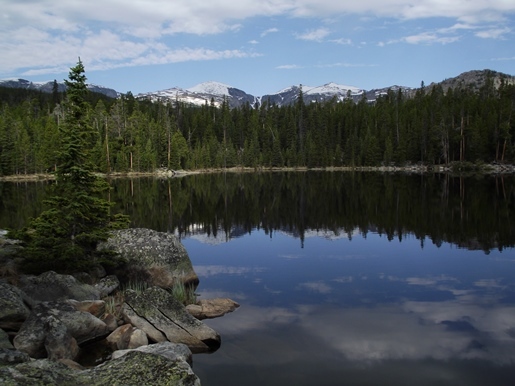 Designated by Congress in 1984, the Cloud Peak Wilderness protects more than 189,000 acres, including the highest peaks in the Bighorn National Forest: 13,167-foot Cloud Peak and 13,005-foot Black Tooth Mountain. The Bighorn National Forest is one of the oldest federally-protected forest lands in the United States. It provides habitat for elk, moose, mule deer, pronghorn, black bear and mountain lion, has over 1500 miles of trails, and protects more than 1.1 million acres. MRATC is a dedicated group of volunteers responsible for maintaining roughly 60 miles of the A.T. This section begins at the Tennessee-Virginia state line and continues through the town of Damascus, Mount Rogers High Country and Grayson Highlands State Park before reaching the south fork of the Holston River. This section is commonly referred to as one of the most scenic sections of the 2,190-mile footpath. MRATC divides its famous section of the Trail into units that are assigned to volunteer section monitors. Section monitors are the authority on their unit of the Trail and are responsible for regularly observing and reporting any problems, performing light maintenance and alerting the club when additional manpower is needed. Several positions have recently become available simultaneously, and MRATC is incorporating an expedited process for training new section monitors and assigning them to their unit by this fall. The Mount Rogers High Country drapes the shoulders of the two highest peaks in the state and is known for its boulder-strewn grassy balds, herds of wild ponies, expansive views and a high-elevation spruce-fir forest. Due to the area’s unique environment and popularity with hikers, MRATC wants to ensure these sections are not left without section monitors for long. New section monitors will be asked to join MRATC and participate in three training events: an informational meeting, an “Introduction to Trail Maintenance” workshop provided by the ATC and at least one MRATC work trip. Those who complete this training will be assigned their unit of the A.T. at a celebration hosted at Damascus Brewing Company in Damascus. New section monitors must commit to this role for at least one year and will be mentored by an experienced club volunteer. Two informational meetings will be held to provide more information for those interested in a section monitor position. The first meeting will be held on Sept. 15 at 6 p.m. at the Henderson School of Appalachian Arts in Marion; the second will be held on Sept. 18 at 3 p.m. at the Damascus Library. Those interested can also contact the ATC’s Central and Southwest Virginia Regional Office via email at atc-varo@appalachiantrail.org or by phone at 540.904.4393. Get outdoors and take part in the celebration for National Public Lands Day 2016, with Big South Fork National River & Recreation Area and Obed Wild & Scenic River on Saturday, September 24. One night of free camping has been authorized at Alum Ford Campground (Big South Fork) and Rock Creek Campground (Obed) as well as for all backcountry permits. Located at Big South Fork, this campground offers a serene camping experience near the edge of the Big South Fork River on the Kentucky side of the park. There are six campsites with grills, picnic tables, and lantern hooks as well as accessible vault toilets. The Sheltowee Trace Trail also passes through this campground. Located at Obed, this campground offers riverside camping spots near the spectacular Emory River. There are 11 campsites with grills, picnic tables, and vault toilet. The campground also connects with the Emory River Nature Trail and the Cumberland Trail. National Public Lands Day is the nation’s largest, single-day volunteer event in which eight federal agencies as well as other groups partner together to maintain and protect the environment. More information can be found at www.publiclandsday.org. Great Smoky Mountains National Park invites the public to join park staff on Saturday, September 24 for the 23rd annual celebration of National Public Lands Day. National Public Lands Day is the nation’s largest single-day volunteer effort to improve and enhance public lands across America. In recognition, the park is hosting a variety of service projects across the park including Clingmans Dome, Elkmont, and the Foothills Parkway West. 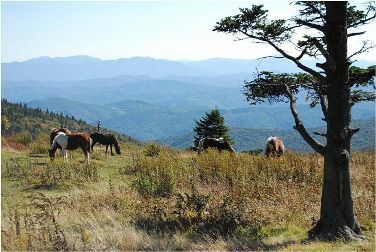 Participants are invited to participate on a trail rehabilitation project along the Forney Ridge Trail near Clingmans Dome where volunteers will work alongside the park trail crew digging out drainage culverts, adding soil to trail turnpikes, sloping trail tread, and naturalizing damaged trailside areas from 9:00 a.m. to 3:30 p.m. Volunteers will hike approximately 2 miles total over steep, rocky terrain. Park staff will also lead an exotic plant removal project at Elkmont where participants will help hand pull English Ivy, an invasive species, from natural areas from 9:00 a.m. to 12:00 noon. Participants are also invited to participate in litter patrols at scenic overlooks along the Foothills Parkway West and Clingmans Dome area from 9:00 a.m. to 12:00 noon. Participants must RSVP for all projects as space is limited. More information on meeting locations for the specific projects will be provided at that time. To RSVP or receive more information, please contact Logan Boldon by email at logan_boldon@partner.nps.gov or phone at 865-436-1278. Participants should wear long pants, long sleeves, and sturdy closed-toed shoes for all projects. Gloves and work gear will be provided. All participants should bring lunch, water, rain gear, and sunscreen. In addition to these service opportunities, several Leave No Trace volunteers will be stationed at Sugarlands Visitor Center and Oconaluftee Visitor Center to share Leave No Trace principals with visitors through hands-on activities and displays that help promote responsible recreational practices on our public lands. For more information on National Public Lands visit https://www.neefusa.org/public-lands-day. On September 24th is your chance to be a part of the nation's largest, single-day volunteer effort for public lands. Throughout the country about 200,000 people will participate in 2,500 National Public Lands Day events. As part of the celebration, national parks will waive entrance fees and host projects and programs that promote environmental stewardship. "Whether a neighborhood park or a national park, public lands belong to all of us," said National Park Service Director Jonathan B. Jarvis. "They might vary in shape and size but they all exist for all of us. Join us on National Public Lands Day and help ensure that these special places can continue to be used for recreation and inspiration." All 413 National Park Service sites will have free entrance on National Public Lands Day. Those who volunteer for a service project will receive a voucher that permits them into a national park for free on a different day. Dozens of National Park Service sites will host events. Take part in spring cleaning in Yosemite National Park, repair a horse trail in Catoctin Mountain Park, preserve earthworks at Richmond National Battlefield Park, or restore the tall grass prairie at Pipestone National Monument. Click here for some of the National Park Service sites hosting National Public Lands Day events later this month. To encourage children and their families to get outdoors, Shenandoah National Park has again partnered with the Kids in Parks program to establish a third TRACK Trails location. This trail is located at the Fox Hollow trail. Supported with a grant from the Shenandoah National Park Trust, this new activity trail includes an introductory exhibit and new activity guide. The public is invited to attend an opening ceremony on Saturday, September 17 at 1:00 p.m. The trail dedication will take place at the Fox Hollow Trailhead at milepost 4.6 on Skyline Drive. Jim Northup, Superintendent of Shenandoah National Park said, "With over 500 miles of trails, Shenandoah offers outstanding outdoor recreational opportunities for visitors of all ages and abilities. As a kid-friendly trail, Fox Hollow is a great place for visitors to both experience the Park and participate in the TRACK Trails program. 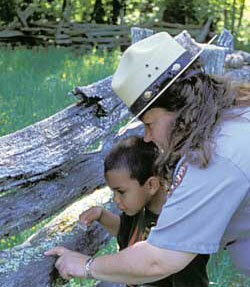 Children who complete the new "Hiking Through History" activity guide can also use it in support of their Shenandoah Junior Ranger Program requirements. It's a great way to have fun outside and learn at the same time." According to Kids in Parks Director Jason Urroz, "Research shows that people have become increasingly disengaged from nature, spending less time in our parks and outdoor places, while spending more time "plugged-in" to electronic media. On average, kids spend 7.65 hours per day "plugged-in" and only an average of 7 minutes per day in unstructured outdoor play. The Kids in Parks program grew out of a vision to address these trends by getting kids "unplugged" and physically active in parks for their health and the health of our parks." Kids in Parks is an expanding network of family friendly outdoor adventures called TRACK Trails. Each TRACK Trail features self-guided brochures and signs that turn your visit into a fun and exciting outdoors experience. For more information on Kids in Parks visit http://www.kidsinparks.com . Visitors are reminded that there is a $20-per-car entrance fee to Shenandoah National Park which is good for seven days. For more information about these events and other park programs, visit the Shenandoah National Park website at http://www.nps.gov/shen/planyourvisit. The Pisgah National Forest begins the next phase of construction on the Catawba Falls Trail on the Grandfather Ranger District on Monday, September 12, to improve the trail and crossing of Chestnut Branch with a new footbridge. The Catawba Falls Trail is a popular hiking trail near Old Fort, NC. Chestnut Branch is the last creek crossing before visitor reach the lower falls. Weekday visitors can expect delays and short closures for work on the trail and to accommodate construction equipment as well as delivery and placement of the new bridge. Visitors should stay on established trails and avoid the construction area. Weather pending, construction is not planned on weekends. Work is expected to be completed by November 1, 2016. Please check the National Forests of North Carolina website (www.fs.usda.gov/nfsnc) for temporary closure notices. This construction is part of a larger effort to provide safe access to Catawba Falls. A new footbridge was installed over the Catawba River in July in partnership with McDowell County, North Carolina State Parks, and a federal Recreational Trails Program grant. The Forest Service and its partners are continuing progress towards making this area more accessible and safe for forest visitors though the route to the upper falls remains dangerous and the public is warned against attempting it. Every month, McDowell County Emergency Management responds to at least one critical rescue at the site from the public seeking access to the upper falls. The best way to enjoy a waterfall is from a safe distance. Stay on established trails and be aware of the extreme danger posed by attempting a closer view of the waterfalls. Never climb on or jump off waterfalls. Don't swim or dive in waterfall pools or wade in streams above waterfalls because of hazardous rocks and currents. Blue Ridge Parkway managers reopened Rock Castle Gorge Trail today, after its closure for nearly a year following extensive damage during a historic flooding event in fall of 2015. Repairs to the trail and recreation area included repair of severe erosion channels, stream bank stabilization, repair or replacement of drainage systems, extensive regrading of trail tread and the installation of two new fiberglass foot bridges. The repairs come after damage from 18 inches of rainfall in the area during a 10-day period last fall. Today, the trail in its entirety is reopen for recreational use. The moderate to strenuous 10.8 mile loop, with elevations ranging from 3,572 feet at Rocky Knob to 1,700 feet at the confluence of Rock Castle and Little Rock Castle Creeks, features opportunities for backcountry camping, fly fishing, viewing of waterfalls, and wildlife.